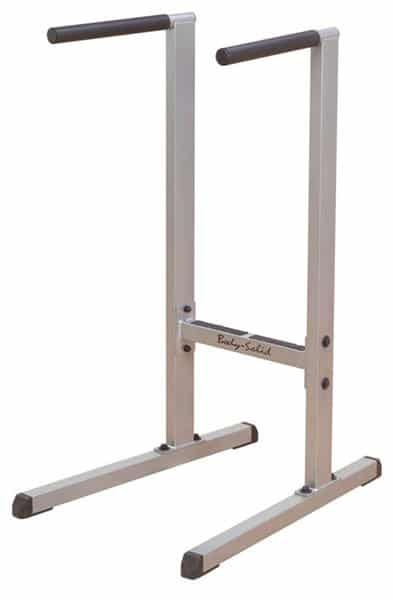 Dip stations are home gym items that usually aren’t purchased separately – on their own – as they are often already included in power racks and power towers. However, if you don’t want to spend a lot of money on the entire power rack or tower, they are great additions to home gyms. Today, I’ll be reviewing for you guys Body-Solid Commercial Dip Station. As with most dip stations, with this one you will be able to full exercise your triceps, chest and deltoids. But what are the main differences among dip stations? As usually, we’ll go through the features, packaging and assembly, pros and cons and final recommendation. So let’s get right to it. The dip station came in one durable cardboard. The strapping was sufficient as well as padding. Nothing was rocking inside, which was a good sign. I was able to assemble the dip station by myself in just under 20 minutes. The package did not include an instruction manual, just one diagram, but that was sufficient. With one wrench and a hammer, it was not a problem. I did not have a problem with putting caps on the handle bars, but I can imagine that someone with larger hands might have trouble with it. I put the dip station on my rug and from the first look it seemed pretty sturdy and stable. The dip station was not rocking at all. When I moved the dip station onto wooden floor, it was still perfectly stable, until I tried some calisthenics on it. There I noticed slight rocking, but it wasn’t that bad. Overall, I was very impressed with the stability and sturdiness of body solid commercial dip station. I’m 5’10 and the dip station’s height of 53 inches (134.6 centimetres) is more than enough. Even taller guys will have no problem using the dip station. The foam grips are very comfortable on hands, while providing enough friction for a tight grip. You can even do proper handstands – that’s something you can’t say about most dip stations out there (yes, that’s right, most). Someone who blueprinted the bars on body-solid dip station deserves a reward. They are not too far apart, so you can do some close-up triceps pulls, while they are still angled a little, so you can focus on chest and shoulders. I would definitely recommend Body-Solid Commercial Dip Station to basically everyone. Unless you are some hard-core calisthenic who would be rocking on it up and down, you can’t go wrong with this one. While the price might seem high, in this case, you’ll definitely get what you pay for.